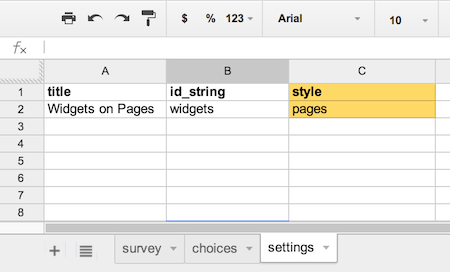 Sometimes it is better to separate a form into multiple pages (like ODK Collect does by default). 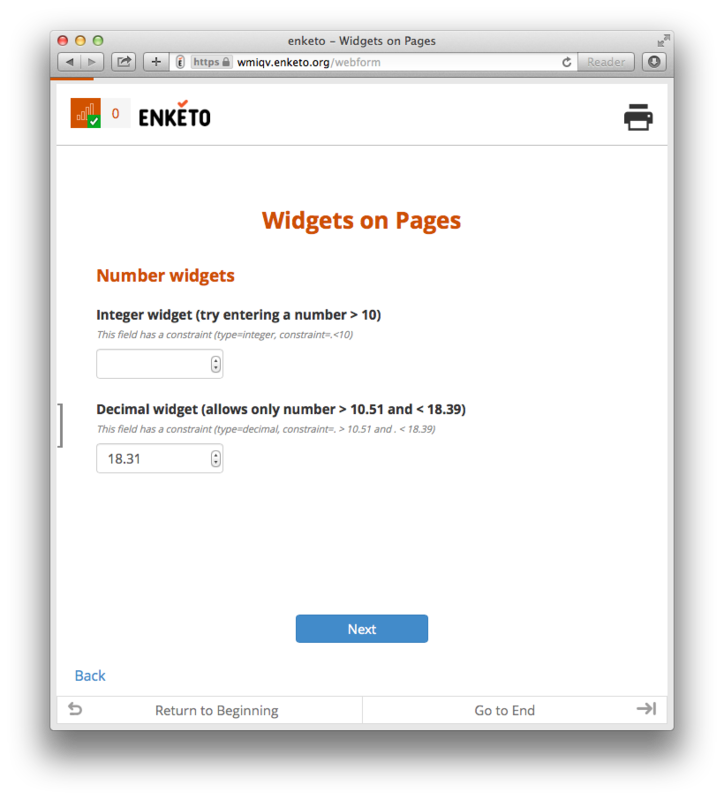 This is now possible in Enketo! The default view will continue to show the whole form on one page, but if you’d prefer to show your form in pages mode, simply add style ‘pages’ on the settings tab of your XLSForm. This requires the latest version of XLSForm (already deployed on formhub and Ona, [edit May 6th 2014] and now also on opendatakit.org). Alternatively, XML warriors can also edit the XML Form by hand by adding class=”pages” to the <h:body> element. SurveyCTO users have built-in support for this from version 1.211 onwards (you need to contact them to request the upgrade to this version). Users of older versions of SurveyCTO can also just upload the XML Form that they generate on e.g. opendatakit.org. Only top-level groups (or XLSForm repeats which are wrapped inside a group automatically) can be displayed on a separate page by adding appearance ‘field-list’. It works the same in ODK Collect. If you’d like to separate a form into more than 1 page, it is best practice to start designing your form by creating all the groups (or repeats) you would like to separate. It is recommended to not place any questions outside these groups (though Enketo has some built-in tolerance for this). If a top-level group (or repeat) has both appearance=field-list and a relevant condition, the page will only be shown to the user if the condition is met. Use the back link and next button to navigate between pages. On a device with a touch screen (or a trackpad) and an advanced browser, you can also swipe between pages. This feature was developed by Ona and Enketo LLC for the HRP project under a contract with WHO.